Beautiful picture isn't it? 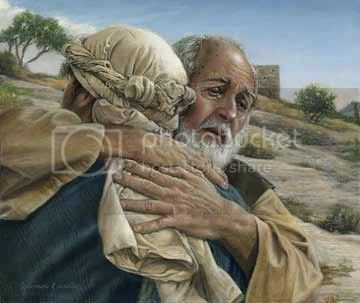 The Prodigal Son being welcomed home by the loving Father he left behind. I've always loved this picture, for it shows plainly the love and compassion upon the Father's face as he clings tightly to his long lost son, who has returned home. This post today is more a personal plea to anyone who may have a divine appointment to come upon this, and has wandered away from the fold: Because I know what its like personally. 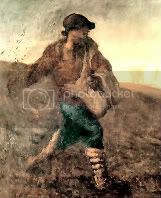 You see, I left the safety of my Father's house one time too--staying away for years, and like the son in this picture and the one Jesus tells us about in Lukes Gospel (chapter 15) found myself in the worlds pig pen before 'coming to myself' and returning to my Fathers house. And you know what? My Father welcomed me home just like the Father in this picture is welcoming his son...with open arms of love, forgiveness, and compassion. He'll do the same for you. I can guarentee it! And the younger of them said to his father, Father, give me the portion of goods that falleth to me. And he divided unto them his living. And not many days after the younger son gathered all together, and took his journey into a far country, and there wasted his substance with riotous living. And when he had spent all, there arose a mighty famine in that land; and he began to be in want. And he went and joined himself to a citizen of that country; and he sent him into his fields to feed swine. And he would fain have filled his belly with the husks that the swine did eat: and no man gave unto him. And when he came to himself, he said, How many hired servants of my father's have bread enough and to spare, and I perish with hunger! I will arise and go to my father, and will say unto him, Father, I have sinned against heaven, and before thee, And am no more worthy to be called thy son: make me as one of thy hired servants. It still causes me to weep when reading this story, for its a reminder of just how great God's love, mercy, and forgiveness is, and how eagerly He wants to bestow it upon us. All it took was the son beginning the journey back home. For even as he was 'afar off'...the Father ran to meet him. Isn't that a wonderful word picture of true love and forgiveness? I have only two more things to say. If you're a prodigal, come home. The Father awaits you, watching daily for your first steps in His direction. Take the first step my friend, and He will run to meet you. Also, if you know a prodigal, don't condemn them my friend, but just remind them that the Father is looking for them to return with open arms. As one who stayed away out of a fear that I wouldn't be welcomed back, I can tell you, those away from the fold need to hear and be reminded of God's love and forgveness--for in most cases they don't 'see or hear it' from within the Church. That is sad, but true. If not one ourselves, we know someone who can fit the picture of the wandering son: perhaps even our own son or daughter. Don't give up on them, continue to pray and lift them up before God. Stand in the gap for them. My prayer is today , may the Holy Spirit bring all 'prodigals home' soon. yes I like the picture very much, I guess you are someone that can relate to art. I was once a prodigal too, how foolish of me, even now, if I am not careful, I can fall into sin again. May the grace of God draw us nearer and nearer to Him. A Man of One Book. Unbelief; Father Forgive them for they Know not. The Lord Is Coming Soon...Hold Fast!